Following a gala bridal shower Linda gave for friends Bill and Beth's soon to be daughter-in-law Alyssa, they hosted a dinner with an extensive progressive wine flight. Dinner featured beef tenderloin, twice baked potatoes and hericot verts with prosciutto and dinner salad. Pre-dinner featured a selection of artisan cheeses. 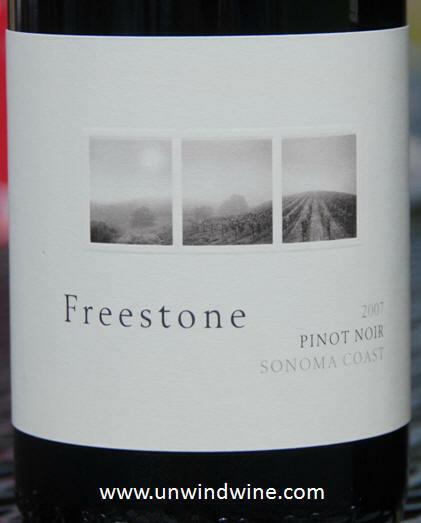 For the pre-dinner wine flight Bill opened with Freestone Sonoma County, then Sea Smoke Ten Pinot Noirs. For a midi, transition from the Pinot's to the big Napa Cab's I brought a Fidelitas Optu Columbia Valley red blend. 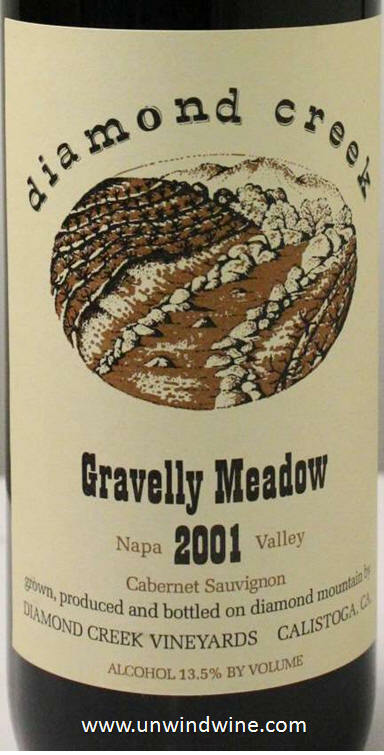 The Main course was highlighted by Diamond Creek Gravelly Meadow, followed by birth-year vintage wine for son and groom to be, Drew, Duckhorn Napa Cabernet. Following dinner with medley of chocolates, Dan opened a brooding a Brunello di Montalcino. Label from 2007 vintage from cellar. I write often about how difficult it is to find a high QPR Pinot Noir at a lower price point. This is such a find. Bill posted his tasting notes for his hosted wines so I defer to his lead. "This is usually our "go to" everyday Pinot and it never disappoints. A bit brighter on the fruit than is my preference but still has some earthiness to provide balance. Was a nice opener to the evening but was overwhelmed by the Sea Smoke 10 that followed." Bill and Dan love this wine and are both club members and get regular allocations. This is a classic example of that addage, the next best thing to having a great wine cellar is having a wine buddy with a great cellar! I enjoy an occasional Pinot Noir, especially in the summer with lighter food fare but generally trend to the Bordeaux varietals which predominate in our collection. This was an elegant and polished pre-dinner wine, great witht the artisan cheeses. Bright vibrant cherry, dusty rose with hints of rhubarb and cranberry. 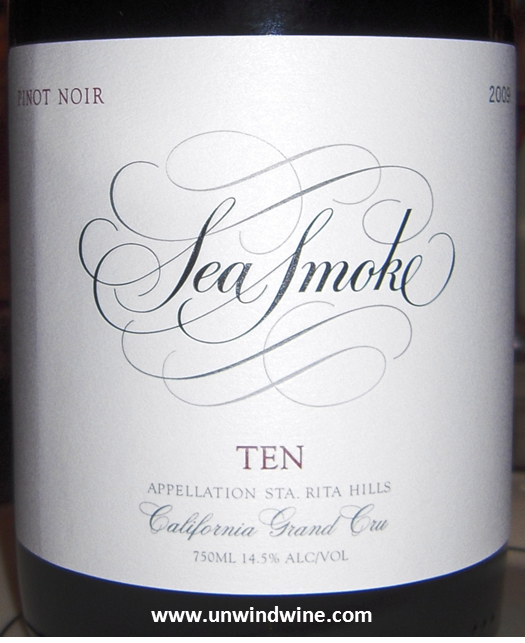 Bill's tasting notes from Cellartracker - "Full disclosure - I am a bigger fan of Sea Smokes Southing than I am 10. I usually find the 10 to be a bit hot and heavy on the alcohol. In retrospect, I likely have been drinking 10 too early. This was delicious. Full bodied, polished, full of ripe cherry and strawberry, balanced by earthy, smoky flavors. This pretty much overwhelmed the 2011 Freestone Pinot that preceded it. An elegant complement to a charcuterie tray to start the evening event." The name Fidelitas means "faithful, loyal, true". I thought this was an appropriate wine for celebrating an upcoming betrothal. 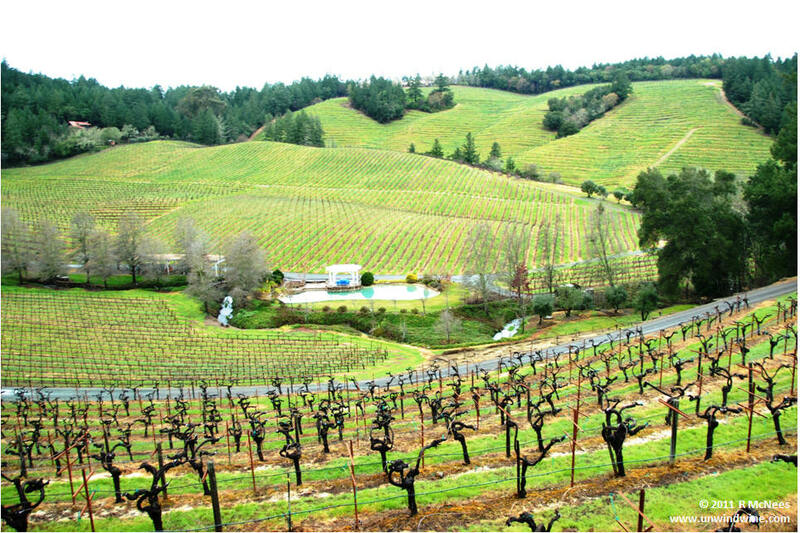 The producer's mantra cry is "Fidelitas is faithful to Bordeaux grape varieties, loyal to modern craft winemaking techniques, and true to Washington State's Red Mountain terroir." I remember attending a wine tasting at the local Binny's, the Chicagoland mega-merchant, now with over thirty stores that recently extended downstate to Central Illinois, and hearing a fellow taster rave about this wine. I research it and obtained a six pack from the producer. It was in its infancy then, 2002 being just the third release. Today, the current release is their 13th vintage of what is now known as Optu Red Mountain, a big, bold wine red blend. The brand has now grown to 18 red wines and two white wines: all Bordeaux-varietals, 90% sourced from Columbia Valley Red Mountain appellation, with the exception of some "lasting vineyard relationships that are too good to pass up", according to the producer. The name OPTU appeared with the 2002 vintage, which as the producer recalls, was their most 'most exciting vintage by packaging standards, and the origin of the name OPTU.' Says, Jess Zander, "I also happen to LOVE this vintage and was lucky enough to hoard some for several years. A blend of 54% Cabernet Sauvignon, 37% Merlot, and 9% Malbec. I believe that this is the first wine we included some Red Mountain fruit with 10% of the make up coming from Red Mountain Vineyard. We bumped the line up to a total of 6 products in this vintage, most notably with the introduction of Champoux Vineyard Cabernet Sauvignon." This was appropriately ordered as a transition from the Pinots to the bigger deeper Napa Cabs. Dark garnet colored, medium full bodied, subdued blackberry with hints of blueberry and plum fruits, with tones of tobacco, tea and hints of medium-light oak, appropriately balanced with medium acidity and moderate, soft tannins. We visited the Diamond Creek Estate with Bill and Beth and the vineyard tour and tasting experience were clearly one the highlights of our Napa Valley Wine Experience in 2011. The Gravelly Meadow vineyard is shown left. When Bill presented this, I anticipated it would be at the apex of its tasting profile and it certainly seemed to be so. When he opened the bottle and poured a taste, the aromas exploded out of the glass with huge fruit and floral perfume. This was exceptionally full flavored and perfectly balanced, its complexity was a harmonious symphony of flavors. 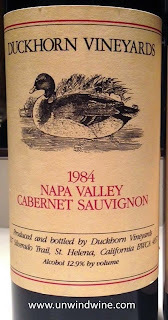 Bill's tasting notes from Cellartracker for this tasting - "I cannot imagine this being any better than it was last night and consistent with prior experience indicating that the 2001 Napa Cabs are undoubtedly in their prime right now. Deep, opaque, purple in the glass. Nose very much resembling a St. Estephe with herbal earthy notes. But this explodes on the palate with layer upon layer of dark cherry, blackberry, chocolate and mocha. Also detected some minerality reflecting the soil composition. This really fills the mouth and has a long, long lingering finish. Likely the hit of a gala dinner with friends Rick, Linda, Dan and Linda. Wish I had another bottle." We've stopped at the Duckhorn Estate in northeast Napa Valley on many occasions during our Napa trips as it sits at the foot and entrance to Howell Mountain. Its an idyllic setting and also enjoyable tasting. To commemorate the day's proceedings, Bill opened this special birth year vintage release Napa Cab. 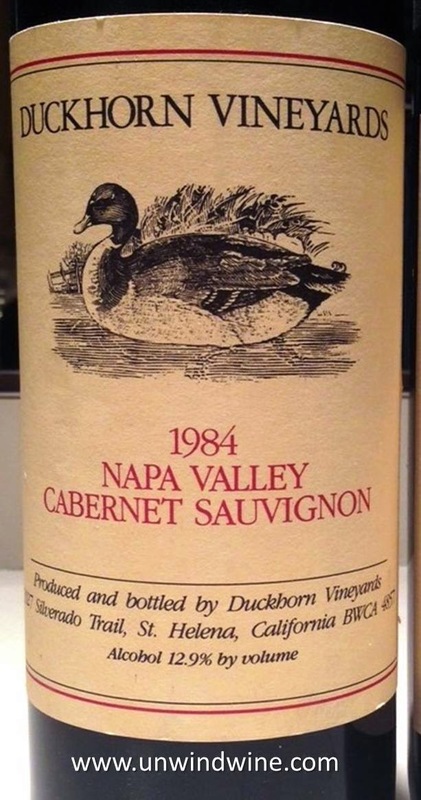 At thirty plus years it showed remarkably well with amazing resilience - still wholly approachable showing the aging potential of hearty Napa Cabs from reputable producers, when cared for and cellared properly. This was a nice complement to the beef tenderloin, the black pepper laced potatoes and the after dinner dark chocolates. While past prime, this wine is still interesting for someone who has experience with older wines. This still retains its indigo color but is showing some bricking. On the palate, while there's still some fruit present, leather, tobacco and cedar flavors are more apparent. Tannins have given way to glycerine. Still this was very approachable, reasonably priced, better than the last bottle. A fitting birth year wine in recognition of second sons impending wedding and the wedding shower given by friends Rick and Linda. Dan brought this from his cellar. A fitting finish to the evening. 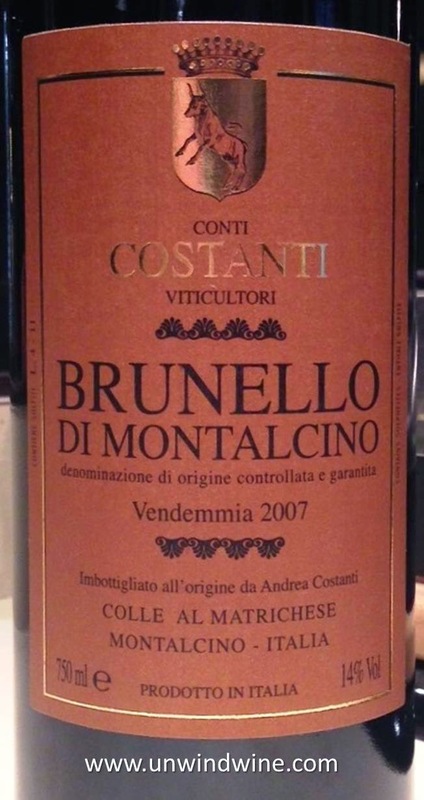 True to the Brunello di Montalcino DOCG, this is 100% Sangiovese. Dark garnet colored, full bodied, complex black berry and black cherry turning to sage, mushroom and earthy forest floor with firm but nicely integrated tannins on the acidic finish.